Use cones and a tape measure to mark out three lines as shown in the diagram above. The player starts behind the middle line, and begins running when signalled by the beep. They turn at the top cone and run back to the starting point again when signalled by the beep. There is an active recovery period of 10 seconds between every 40m shuttle, during which the player must walk or jog around the bottom cone and return to the starting point. A warning is given when the player does not complete a successful shuttle in the allocated time and the player is removed from the test after 2 warnings. A warning is also given if the player fails to intersect the 20m line with their foot when turning, i.e. players are not allowed to turn short of the line. False starts are prohibited as they give players extra time to complete the shuttle. Repeated false starts should be punished with a warning. The last completed shuttle is used as the performance score. The Prone Plank Hold is an indicator of anterior trunk strength. It is very simple to carry out this test and you only need a stopwatch. 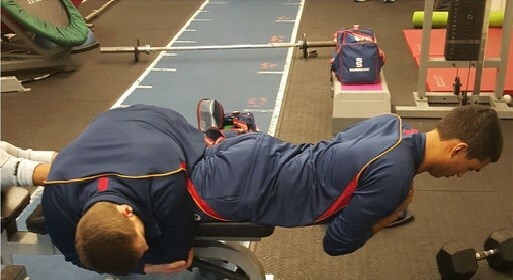 Procedure: The plank must be held, with arms separated. Back and legs must be straight at all times. Cues can be given to ensure this position remains. However once this can no longer be held the test must be ceased. 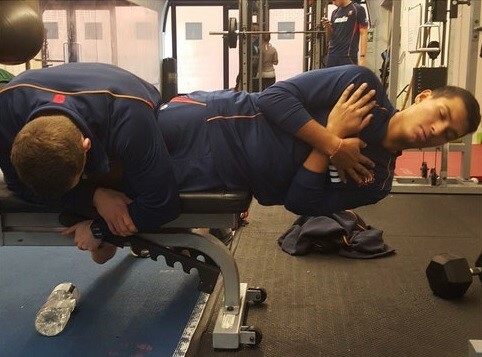 The Prone Extension Hold is an indicator of posterior trunk strength. It is very simple to carry out this test and you only need a stopwatch, a physio bed/gym bench and a helper to hold you. Procedure: This must be held, with arms crossed at the chest. Back and head must be straight at all times. Cues can be given to ensure this position remains. However once this can no longer be held the test must be ceased. 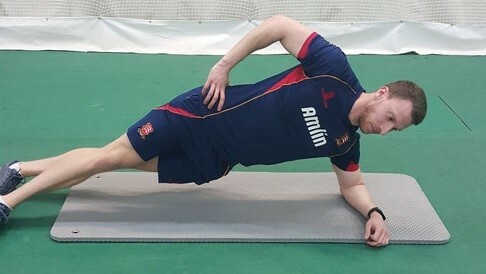 The Side Plank is an indicator of lateral trunk strength. It is very simple to carry out this test and you only need a stopwatch. Procedure: The side plank must be held, with free hand on the top hip. Top foot is in front of bottom foot; heel to toe. Cues can be given to ensure this position remains. However once this can no longer be held the test must be ceased. The Off Bench Side Hold is an indicator of lateral trunk strength. It is very simple to carry out this test and you only need a stopwatch, a physio bed/gym bench and a helper to hold you. This test is a step up in intensity from the Side Plank (above). The Broad Jump is an indicator of lower limb explosiveness. It is very simple to carry out this test and you only need a tape measure. Procedure: The athlete must put their toes to the start line and dip and drive to jump as far as possible. They have to be able to stick the landing for at least two seconds. The distance is recorded from the start line to the heel of the athlete closest to the start line.